Congratulations Amy Hart! You're my winner and will receive a download of Wicked Desire! 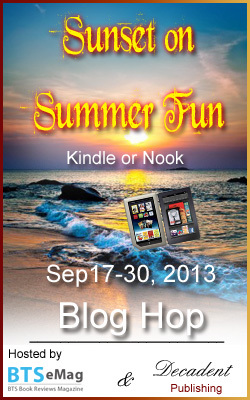 Grand Prize is a Nook HD or a Kindle Fire! Make sure you enter the Rafflecopter below. Link for participating authors is below the banner. I will also be giving away a prize, as will most of the participating authors. Leave a comment answering the following question, and your email addy. One winner will be announced tomorrow, to receive a download of Wicked Desire. Question: What was your favorite summer fun? I had a busy summer, and barely left the house. With my daughter working days, and her husband nights plus overtime, I became the built-in granny-nanny. They decided to keep my granddaughter home during the summer, so that left me with two little ones to look over most of the week. When I lived up north we would spend our evenings running in fields and catching fire flies, or rolling down hills. The grass was always so soft and springy, not like here in Florida. Good times! I enjoyed the longer summer days that gave me more time to spend out in the warmer weather. Pretty boring in our house this summer, but we did get away for a long weekend to take in a Cirque du Soleil show. My favorite summer fun was my anniversary weekend getaway. Riding the merry-go-round with my nieces. I could have done that all day. That's a good one, Pam. Do you have a favorite place you go to or is it different every time? You know what, Susan, I can't ever recall riding a merry-go-round. I did the teeter totter, swings and slide but that's about it. How many nieces do you have? I have one. You can never go wrong going to the beach. I'm not a sun goddess, but I do like seeing the ocean, and walking in the water. Luckily, when I get the urge there's a beach right down the road.